Attaining stable fixation is often difficult in complex proximal humeral fractures because of comminution and poor bone quality. Locking plates have recently been introduced for proximal humeral fracture fixation and have yielded favorable clinical outcomes. However, complications such as secondary loss of reduction, varus malalignment, and screw cuts have been reported ,,,. In the past decades, cloverleaf plates have been commonly used for proximal humeral fracture fixation and have yielded favorable clinical results. However, biomechanical studies have revealed that cloverleaf plate fixation has inferior mechanical strength compared with locking plate fixation ,. Tension wiring is a commonly used operative technique for internal fixation of fractures and may serve as an augmentation device on the fixation construct ,,. Therefore, we describe an alternative fixation procedure involving a cloverleaf plate augmented with tension wiring on the screws. The proposed procedure yielded superior stability and favorable clinical outcomes. Between 2007 and 2009, the tension wiring and plating technique was performed in two men and three women (aged 54–71 years) with proximal humeral fractures [Table 1]. All fractures were classified as three-part fractures according to the Neer classification. Four were fresh cases and one patient received revisional osteosynthesis because of primary fixation failure [Figure 1]. The patients were seated in the beach chair position. The proximal humerus was exposed using the standard deltopectoral approach. The fracture site was irrigated, and the debris and hematoma were removed. The fracture was reduced through direct manipulation and leverage and temporarily fixed with multiple Kirschner wires. An artificial or allogenic bone graft was used to repair the metaphyseal bone defect. After acceptable fracture reduction was achieved, a 3.5 mm nonlocking cloverleaf plate was selected, and anatomical plate-based precontouring was performed by cutting the superior arm and bending the anterior and posterior arms [Figure 2]a. Screws superior and inferior to the ovoid screw hole were termed the head and shaft screws, respectively. Subsequently, fixation was completed by inserting the screws into the plate. A stainless steel wire was placed before securing the screws. Two head screws in the bilateral arm and a shaft screw were tightened with the cerclage wire, creating a triangular loop [step 1, [Figure 2]a, arrow]. Another loop was created between one or two head screws and one shaft screw [step 2, [Figure 2]b. After tightening the wires under tension, the screws were secured [Figure 3]. Fluoroscopy was performed to confirm fracture reduction. The procedure was successful in all five cases and the fractures healed in all cases with no loss of reduction such as varus collapse. Two of those five patients underwent implant removal after 1–3 years because of implant irritation. A 71-year-old woman presented to the orthopedic emergency room with right shoulder pain and disability after falling from stairs. Plain radiography revealed a fracture in the right proximal humerus, which was classified as a three-part fracture according to the Neer classification. Initial fixation was achieved using a locking proximal humeral plate (LPHP) (Synthes, Switzerland). However, the implant broke and loss of reduction was observed 2 months after surgery [Figure 1]a. Revisional osteosynthesis was recommended, but the patient could not afford another LPHP. Therefore, our alternative procedure involving fixation with a nonlocking cloverleaf plate augmented with tension wiring was applied. The details of the surgical procedure are described previously. Postoperatively, a standard shoulder sling was used to protect the involved arm for 2 weeks; subsequently, an early rehabilitation program was initiated with active assisted range-of-motion exercises. This patient was then lost to follow-up at our clinic but returned 3 years after surgery. She complained of mild soreness when abducting her arm by more than 140° and asked for removal of the implants. Radiographic evaluation revealed full healing of the fracture [Figure 1]b and [Figure 1]c. Therefore, the implants were removed, resulting in symptom relief. Attaining stable fixation in proximal humeral fractures is often difficult because of comminution and poor bone quality. 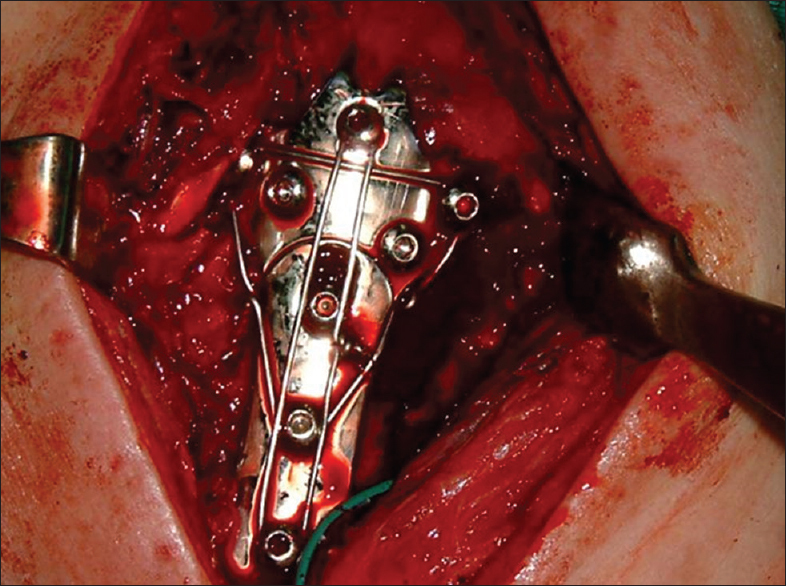 Numerous surgical techniques and devices have been proposed, such as percutaneous pin fixation, intramedullary nails, plates and screws, and locking plates. In recent years, the locking plate has been used to treat osteoporotic bone fractures. Biomechanical studies have revealed that the holding power of the humeral head of the locking plate is significantly higher than that of the nonlocking cloverleaf plate ,. Recent studies have reported favorable functional outcomes after fixation with the proximal humeral locking plate. However, overall complication rates of up to 33% have been reported ,,,. The use of the cloverleaf plate for open reduction and internal fixation is a suitable treatment option. Although more than half of patients exhibit favorable outcomes after cloverleaf plate fixation ,,, some complications have been reported. Secondary varus displacement, varus malunion, and screw cuts are common. The rotator cuff force is a major factor contributing to varus displacement and loss of reduction . When the shoulder is abducted to 60°, the rotator cuff force may reach 9.6 times the weight of the upper extremity . To counteract the angular force in the proximal humerus, a metal and nonmetal suture technique was previously used ,. Furthermore, the metal or nonmetal suture serves as an augmentation device on the fixation construct. Yildiz et al. and Lu et al. used a combination of two intramedullary pins and tension wires for fixation. Kim et al. placed tension band sutures between the distal screw of an interlocking nail and the rotator cuff. Cornell  passed the tension wire beneath the supraspinatus tendon and distally beneath a nonlocking T-plate. Cheon et al. suggested that using tension wire augmentation for plate fixation yields clinical outcomes identical to those obtained using the locking plate. Therefore, we modified this tension wire augmentation technique by looping the tension wire between the head and shaft screws. In this device, the plate provides adequate stability to the fractures. The nonlocking screws facilitate the application of wires between the screws and the plate. The tension wire on the screw system, first described by French , has been used in corrective osteotomy of the cubitus varus. French  suggested that the screws tightened by the wire loop can provide a compressive force to counteract the varus force in the elbow. In our technique, looping of the screws by the tension wire could provide a compressive force to counteract the tension of the rotator cuff. We advocate this technique as an alternative to the proximal humeral locking plate because it can provide adequate stability. One of the limitations of this technique is that it is an open procedure, which may increase the operation time and blood loss. Second, the node of the tension wire may cause soft-tissue irritation and is associated with a risk of neurovascular injury. Therefore, in this study, the node was bent and flattened on the plate [Figure 3]. In conclusion, we present a new fixation technique for proximal humeral fractures involving a combination of nonlocking cloverleaf plating and tension wiring. This fixation method can serve as an alternative to commercial locking implants, and the results are encouraging. Although the results of this new technique are promising, additional biomechanical studies and long-term follow-up are recommended. The study was conducted in accordance with the Declaration of Helsinki and was approved by the local ethics committee of the institute (SCMH_IRB No: 1051003). Informed written consent was obtained from all patients prior to their enrollment in this study. Owsley KC, Gorczyca JT. 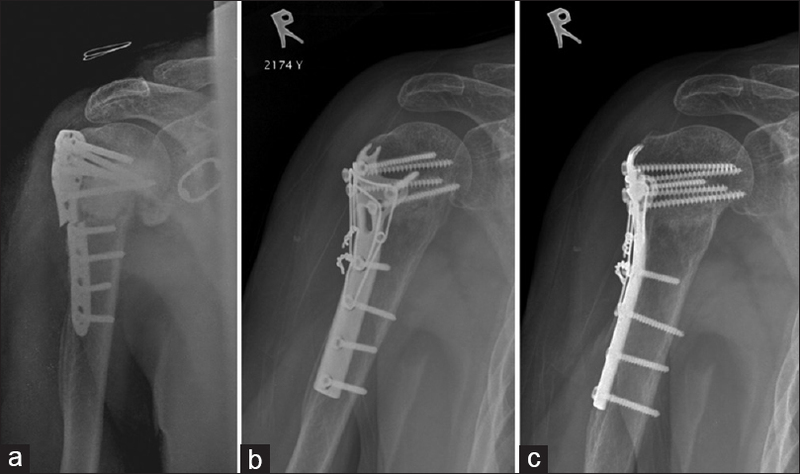 Fracture displacement and screw cutout after open reduction and locked plate fixation of proximal humeral fractures [corrected]. J Bone Joint Surg Am 2008;90:233-40. Brunner F, Sommer C, Bahrs C, Heuwinkel R, Hafner C, Rillmann P, et al. Open reduction and internal fixation of proximal humerus fractures using a proximal humeral locked plate: A prospective multicenter analysis. J Orthop Trauma 2009;23:163-72. Südkamp N, Bayer J, Hepp P, Voigt C, Oestern H, Kääb M, et al. Open reduction and internal fixation of proximal humeral fractures with use of the locking proximal humerus plate. Results of a prospective, multicenter, observational study. J Bone Joint Surg Am 2009;91:1320-8. Sproul RC, Iyengar JJ, Devcic Z, Feeley BT. A systematic review of locking plate fixation of proximal humerus fractures. Injury 2011;42:408-13. 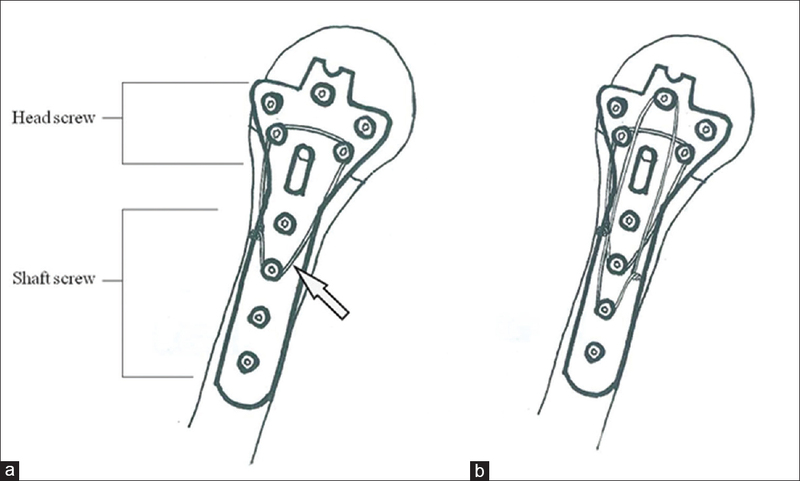 Walsh S, Reindl R, Harvey E, Berry G, Beckman L, Steffen T. Biomechanical comparison of a unique locking plate versus a standard plate for internal fixation of proximal humerus fractures in a cadaveric model. Clin Biomech (Bristol, Avon) 2006;21:1027-31. Lever JP, Aksenov SA, Zdero R, Ahn H, McKee MD, Schemitsch EH. Biomechanical analysis of plate osteosynthesis systems for proximal humerus fractures. J Orthop Trauma 2008;22:23-9. Cornell CN. Internal fracture fixation in patients with osteoporosis. J Am Acad Orthop Surg 2003;11:109-19. Lu CC, Chang MW, Lin GT. Intramedullary pinning with tension-band wiring for surgical neck fractures of the proximal humerus in elderly patients. Kaohsiung J Med Sci 2004;20:538-45. Yildiz C, Kürklü M, Ozkan H, Bilgiç S, Sehirlioglu A, Yurttas Y, et al. AO tension band technique application in proximal humerus fractures. Eklem Hastalik Cerrahisi 2010;21:62-7. Esser RD. Open reduction and internal fixation of three- and four-part fractures of the proximal humerus. Clin Orthop Relat Res 1994;299:244-51. Esser RD. Treatment of three- and four-part fractures of the proximal humerus with a modified cloverleaf plate. J Orthop Trauma 1994;8:15-22. Küchle R, Hofmann A, Hessmann M, Rommens PM. The cloverleaf plate for osteosythesis of humeral head fractures. Definition of the current position. Unfallchirurg 2006;109:1017-24. Inman VT, Saunders JB, Abbott LC. Observations of the function of the shoulder joint 1944. Clin Orthop Relat Res 1996:3-12. Flatow EL, Cuomo F, Maday MG, Miller SR, McIlveen SJ, Bigliani LU. Open reduction and internal fixation of two-part displaced fractures of the greater tuberosity of the proximal part of the humerus. J Bone Joint Surg Am 1991;73:1213-8. Kim KC, Rhee KJ, Shin HD. Tension band sutures using a washer for a proximal humerus fracture. J Trauma 2008;64:1136-8. Cheon SJ, Lee JM, Lee JS, Kim HT, Suh JT. A comparative study of three different fixation techniques for displaced two- and three-part proximal humeral fractures. J Korean Orthop Assoc 2011;46:372-9. French PR. Varus deformity of the elbow following supracondylar fractures of the humerus in children. Lancet 1959;2:439-41.